Increase your freedom and release your creativity with a Navigator™ Computerized Quilting System. Follow the easy steps to Edge to Edge quilting or use the many available tools to create a truly original masterpiece. Equipped with the Microsoft Surface Pro, the Navigator™ provides you capabilities for design layout, editing, and complete control of final pattern stitch out. The incredible quick release system allows the quilter to easily go back to free-motion quilting in just a few seconds. 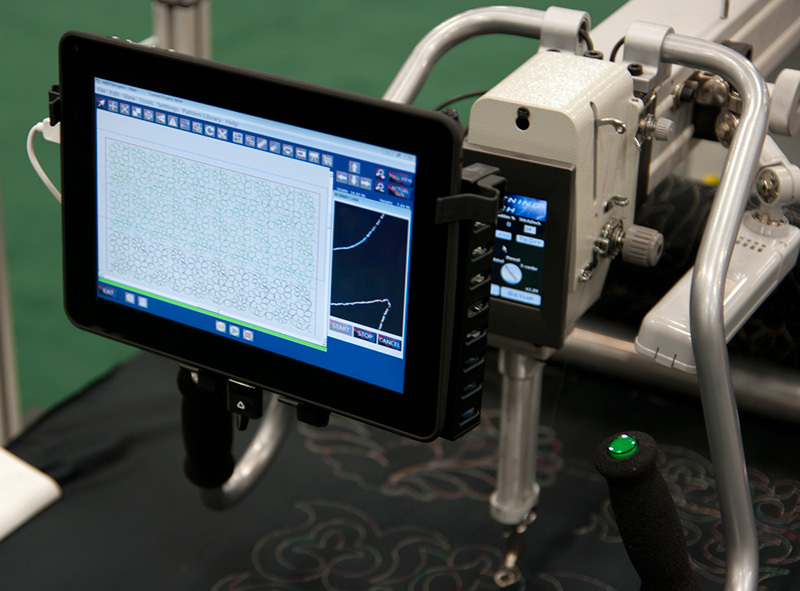 Navigator™ comes standard loaded with fifty patterns and has the ability to upload .dxf file format patterns, or Innova’s proprietary .pat file format, providing compatibility with thousands of digitized quilting patterns and designs. Designs are available from dozens of well known pattern designers on the internet or you may draw your own by using software such as Art-n-Stitch, Pre-Design Studio, Autosketch or Pro-Q designer. With the Navigator™ , patterns can be resized, trimmed, copied, and rotated. Free-motion quilting can be recorded and saved so the recording can be used on the current quilt or at a later time. The thread break recovery feature is an excellent safeguard, in the event that the bobbin thread runs out. The sewing head can be moved to the exact location and stitching can resume from that point. Building on the Innova’s ability to sew 3000 stitches per minute, the maximum travel speed is 8 inches per second with an average travel speed of 4 inches per second. Navigator™ Robotics system operates under similar control same as found on our large format CNC industrial quilting machines. ABM International is the original inventor of computerized quilting and has the original United States Patents to prove it. We have been manufacturing computerized machines since the late 1970’s and has proven the Navigator™ system to be both reliable and efficient. The Navigator™ is an excellent addition to the INNOVA™ longarm quilting system. This dongle enables AutoPilot and Navigator owners to use encrypted patterns. Extra clamps to be used with the Red Snapper loading system. This product includes 6 x 2" clamps in one package.